Cognitive networks are the future, and they are needed simply because they enable users to focus on things other than configuring and managing networks. Without cognitive networks, the pervasive computing vision calls for every consumer to be a network technician. The applications of cognitive networks enable the vision of pervasive computing, seamless mobility, ad-hoc networks, and dynamic spectrum allocation, among others. In detail, the authors describe the main features of cognitive networks clearly indicating that cognitive network design can be applied to any type of network, being fixed or wireless. They explain why cognitive networks promise better protection against security attacks and network intruders and how such networks will benefit the service operator as well as the consumer. Explores the state-of-the-art in cognitive networks, compiling a roadmap to future research. Covers the topic of cognitive radio including semantic aspects. Presents hot topics such as biologically-inspired networking, autonomic networking, and adaptive networking. Introduces the applications of machine learning and distributed reasoning to cognitive networks. Addresses cross-layer design and optimization. Discusses security and intrusion detection in cognitive networks. 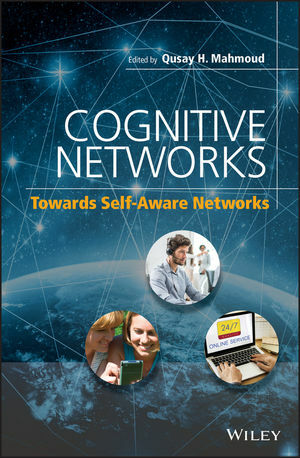 Cognitive Networks is essential reading for advanced students, researchers, as well as practitioners interested in cognitive & wireless networks, pervasive computing, distributed learning, seamless mobility, and self-governed networks. With forewords by Joseph Mitola III as well as Sudhir Dixit. Qusay H. Mahmoud is an Associate Professor in the Department of Computing and Information Science at the University of Guelph, Canada. He holds a PhD in Computer Science from Middlesex University (UK), and an M.Sc. in Computer Science and a B.Sc. in Data Analysis, both from the University of New Brunswick (Canada). Qusay is the author of two books: Distributed Programming with Java (Manning Publications, 1999) and Learning Wireless Java (O'Reilly, 2002), which have been translated to Korean, Simplified Chinese, and Czech. He has been a guest editor at major international journals, and has presented tutorials at international conferences worldwide. His research interests include distributed systems, mobile computing, middleware, agent technology, and service-oriented computing. Qusay is a Senior Member of the IEEE, and Associate Editor of the ACM Transactions on Internet Technology. Chapter 1: Biologically Inspired Networking. Chapter 2: The Role of Autonomic Networking in Cognitive Networks. Chapter 5: Machine Learning for Cognitive Networks: Technology Assessment and Research Challenges. Chapter 6: Cross-Layer Design and Optimization in Wireless Networks. Chapter 7: Cognitive Radio Architecture. Chapter 8: The Wisdom of Crowds: Cognitive Ad hoc Networks. Chapter 9: Distributed Learning and Reasoning in Cognitive Networks: Methods and Design Decisions. Chapter 10: The Semantic Side of Cognitive Radio. Chapter 11: Security Issues in Cognitive Radio Networks. Chapter 12: Intrusion Detection in Cognitive Networks. Chapter 13: Erasure Tolerant Coding for Cognitive Radios.